As profiled in several articles earlier on the website, many players in the once thriving HK enamelware industry in the 1950s-60s had either shut down or relocated their operations to West Africa (where in some cases they had moved into other industries). Lucky Enamelware Factory is one of the few which remains in business in HK today although its production had relocated to the mainland since the 1980s. Founded in 1951 by Chow Yuk Ho (周毓浩,brother in law of Holia Chow of Rox Industrial who was profiled earlier), a long-time executive of I-Feng Enameling (see a number of related articles), Lucky like I-Feng also had a vacuum flask manufacturing affiliate by the name of Leader Manufactory which was known for its “ Shield” (金盾牌) brand of thermos flasks. A native of Liyang (溧阳) county of the Changzhou prefecture (常州) in Jiangsu province, Chow Yuk-ho started working in the enamelware industry in Shanghai in the 1910s and joined I-Feng Enameling which was founded in 1921 in Shanghai by the Tung family. At I-Feng, he was responsible for production and managed the HK and Canton operations in addition to serving on the board of a paint factory in Shanghai. In 1947, he moved to Hong Kong with his family and continued to work for I-Feng until he struck out on his own in 1951 and formed Lucky which was known for its “Lucky” and “Red Leaf” brand of enamelware. According to a news report from Singapore in the 1950s, Lucky accounted for allegedly half of all HK enamelware exported to Singapore and Malaya. Chow was assisted at Lucky by his younger brother Chow Yuk-ying (周毓英) – also known as Chow Horng-shing (周洪鑫) who later started the pen maker Rox Industrial with his wife Holia. He was also supported by long-time executive Hsieh Chih-Chuang (謝熾莊) who traveled to Southeast Asia to promote Lucky’s products.For his plant, he acquired a plot in To Kwa Wan which encompassed 142 Pau Chung Street (炮仗街) and 31 San Shan Road (新山道) – also known as 151 Kowloon City Road – where he employed many workers from his native Liyang. Outside of business, Chow was an active community leader and earned the nickname of “Buddha” (佛爺) for his kindness and generosity. He was director of the Tung Wah Group of Hospitals (1948/1949) and Pol Leung Kuk, vice chairman of the Kiangsu-Chekiang Residents Association and HK Enamelware Manufacturers Association, director and deputy treasurer for the Chinese Manufacturers Association for which he led the delegation to Indonesia and co-led the delegation to Singapore in the 1950s. A strong believer in education, he established bursaries for students with financial difficulties and appealed to his fellow Shanghainese for supporting needy students to pursue their education. In January 1957, Chow Yuk-ho died and was buried in the Catholic Cemetery in Happy Valley. He was survived by one son – Donald H.K. Chow (周克强) and two daughters – Audrey Marilyn Chow Pei-fung (周佩芬) and Therese Chow Pei-fong (周佩芳). Both Donald and Audrey Chow studied ceramics overseas and took over Luckyafter their father’s death. A graduate of St. Mary’s Girls School in Shanghai, Audrey graduated from North Staffordshire Technical College in the UK and was a pioneering female industrialist in the 1950s and 1960s as managing director of Lucky. She married the son of Peter Ging-shan Lock (1897-1994), the UK textile engineer who was the manager of the leading spinning mill South Sea Textiles. Donald was a member of the Rotary Club of Kowloon West and served as vice chairman and executive committee member of the Chinese Manufacturers Association. Left: Leader Industrial Centre in Tsuen Wan; Centre and Right: Shield vacuum flask made by Leader Manufactory in HK. Three months after Yuk-ho’s death, his children formed Leader Manufactory at 31 San Shan Road in To Kwa Wan with HK$200,000 in capital to manufacture vacuum flasks. Essays posted online by Xu Ding-an (徐定安), the grandson of the founder of Golden Pavilion vacuum flask factory in Shanghai claimed that his father Hsu Ching-kwok was involved in the founding of Leader with the Chows in 1957 when he left Shanghai for HK but according to registration information in the Far Eastern Economic Review, the initial subscribers of capital were King Tung-Ming (金通明), the manager of the HK branch of China Insurance (listed address as 6 Kai Yuen Terrace in North Point) who was a long-time director of Lucky (another nonfamily member who was manager of the firm in the 1960s was Yuen-Gong Ching) and Audrey Chow (listed as technician living in 5 Rutland Quadrant in Kowloon Tong) and a 1959 article about Leader also made no mention of Hsu. (Xu’s article also asserts that Leader was making “Golden Pavilion” flasks but there are no other records of that elsewhere and that was a brand manufactured by his uncle K.D. Lee’s Hwa Chong Enamel) By 1959, Leader was making 5000 dozens flasks per month with the capacity to produce up to 10000 dozens. In addition to making its own flask, the firm also supplied the interior brass chamber for other flask manufacturers in HK. 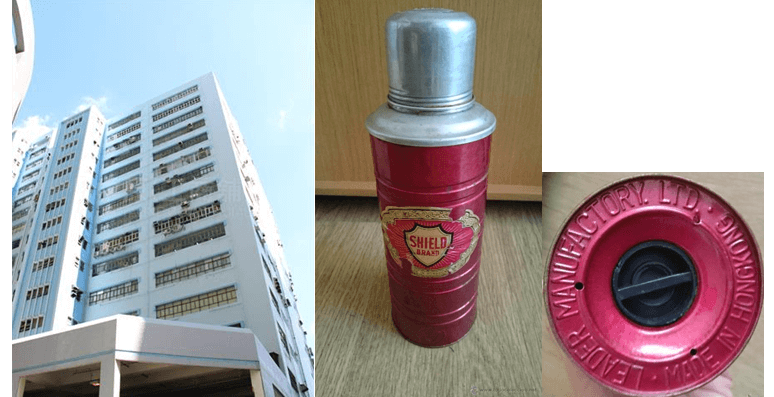 Its “Shield” brand of vacuum flasks also was popular in Singapore and Malaya and Audrey Chow visited Singapore that year to promote the products. In the 1960s, Leader moved into its new plant in 188-202 Texaco Road in Tsuen Wan. In December 1964, a major fire broke out at the Lucky factory at 151 Kowloon City Road in To Kwa Wan, resulting in over HK$700,000 in damages but fortunately no one was hurt. The next year, the Lucky Building (立基大廈) was built at adjacent 142 Pau Chung Street in To Kwa Wan where it still stands. Starting in the late 1960s, the Chow family began to look overseas for production in addition to exports. They were involved in Malaya Ceramic Industries SdnBhd in Malaysia, which merged in 1971 with Malayan United Industries and Tong Meng Enamel to form Oriental Enamel Industries to minimize competition in the Malaysian enamelware market. In 1988, the Chow family re-developed the factory site of Leader in Tsuen Wan into Leader Industrial Centre (立泰工業中心,a large complex with 2 blocks, not to be confused with the industrial building with the same English name in Fo Tan) in partnership with the property developer Cheung Kong Holdings. With the enlarged space in the new building, Lucky moved out of its To Kwa Wan site into Leader Industrial Centre and ultimately moved all of its production to the mainland. The original Lucky factory site at 151 Kowloon City Road in To Kwa Wan was re-developed by the family holding company Lucky Clover Enterprises Ltd (立基企業有限公司) into the 24-floor story residential building Homing Terrace (浩明雅苑) in 2002 with construction work completed by Hsin Chong Construction (see article) whose proprietors the Yeh family had known the Chows for three generations. The project generated over HK$150 million in income. Outside of Lucky and Leader, Audrey Chow is a female pioneer in the securities business as the founder of Audrey Chow Securities (高陞證券), a co-founder of Far East Stock Exchange in 1969 and a former director of the Stock Exchange of Hong Kong.Her son Nicholas Lock (駱有隆) is a director of Audrey Chow Securities and Lucky Clover while her daughter Josephine Lock (駱晶瑩)is married to Barry Cheung (張震遠), the former Executive Councillor who made headlines in recent years with the collapse of his HK Mercantile Exchange. Therese Chow Pei-fong, the younger daughter of Chow Yuk-ho, studied law in the UK and Canada and formed the law firm of Therese P.F. Chow & Co. in 1971 after returning to Hong Kong. She extended the philanthropic efforts of her father and made a generous donation in support of the establishment of the Chow Yuk Ho Technology Centre for Innovative Medicine at CUHK in 2014, in memory of her father. The Centre focuses on three research areas in robotics, imaging and biosensing, including nano-robotics, innovative neuro-imaging and non-invasive medical monitoring, to enable more effective treatment for patients in need. She also established the Therese Pei Fong Chow Research Centre for Prevention of Dementia at CUHK. This article was first posted on 28th September 2018.